And friends it’s time for my last book review from the honeymoon. Let’s just say I’m not writing about this one last because it was my least favorite. I read this book in less than 48 hours, was left in tears, and was moved enough to leave it at the apartment we stayed at in their little “library.” I hope someone else picks and up and is moved in the same way I was. . . The Fault In Our Stars, by John Green, follows a young girl, Hazel Grace, through her battles being a teenager. The one difference in young Hazel’s story? She’s also battling Stage 4 Thyroid Cancer with metastasis on her lungs. Sounds like a dark premise, right? Sure, it is, but it does not make the it a dark story. Even when her illness restricts her to home schooling, carrying around oxygen, and struggling to move around without being winded, Hazel stays triumphant. A part of Hazel’s treatment (and pacifying her concerned parents) is going to a support group once a week. For Hazel, this is really her “social” time, as regular schooling and social activities are a challenge for her. At one of these groups, Hazel meets a young man, Augustus Waters and is immediately intrigued. You see, Hazel hasn’t allowed herself to get close to many people, as she feels like a “ticking timebomb” ready to go off and destroy all of those left in her path. That is, until she met Augustus. The relationship between the two develop through mutual tragedy (cancer) and a love for specific books. For Hazel, that book is An Imperial Affliction, by the Dutch author Peter van Houten. A tale that is left unfinished and has beautiful tortured the young girl since her first reading. The peak of their romantic tale is a trip to Europe to meet the author and learn exactly what happened to the characters in the story. You see the story haunted Hazel due to her own concerns with health and what will happen to her own family when she has lost her battle. Hazel’s entire world takes a turn this trip, not only from meeting this idol of hers but also finding out Augustus may be hiding something from her. . .
Like I already said, within 48 hours I found myself crying, smiling, and bleeding from my heart for the characters in this story. To read such a jarring story of love from the emotional teenage perspective is moving, saddening, but moving in such a unique way. John Green paints such an amazingly raw and true picture that this story is guaranteed to stick with you long after you put it down. It’s something in fiction that you really just don’t see that often anymore, and I cannot recommend it enough. But come prepared with tissues! So my first honeymoon review isn’t exactly honeymoon themed… but that doesn’t mean it isn’t exciting. It’s about the first of 3 books I finished on the trip! Christmas seems like it was ages ago at this point (almost March. Are you KIDDING ME? ), but I guess a honeymoon and holiday’s will do that to you. Moving on. . . one of my favorite gifts that my dear husband got me this year was something possibly a little unexpected. Zach knows me very well and fully appreciates and relates to my passion for understanding where my food comes from. 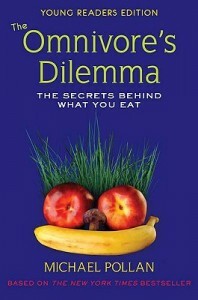 I had heard of the Omnivore’s Delimma, but obviously never gotten my hands on it. I was really excited to jump right into this read and did so before our trip even started (we had lots of travels in early 2014, ha). While I feel pretty knowledgeable about food, agriculture and our resources, I still found myself surprised by a lot of what I read. I highly recommend this read to anyone interested in the topic or someone who is looking for a little more information about just where their food is coming from. Omnivore’s Delimma is Pollan’s experience with today’s food industry. The book, and story, itself is told through four different “dinners”: an industrial (fast food) meal, an industrial organic meal (Whole Foods) , an organic pasture-grown meal, and finally a meal solely foraged by Pollan himself. The first dinner, the Industrial meal, was an all american burger from a fast food joint in any-town USA. Focusing specifically on agriculture and corn, this chapter engages the reader automatically with shocking stats like “There are some 45,000 items in the average American supermarket, and more than a quarter of them contain corn.” Pollan does a spectacular job of bringing the reader through America’s agriculture history with this prolific crop: from the sweet corn on the cob we enjoy each summer to the crap we would never eat that is processed into animal food or, God forbid, High Fructose Corn Syrup. A quarter of the items in our supermarket, INCLUDING THE CLEANING ITEMS AND WEIRD ODDS AND ENDS? Scary. The second dinner, the industrial organic meal, was a meal straight from one of my favorite spots, Whole Foods. Here Pollan dissects the different food labels we have all grown so accustomed to, like organic, free range, and grass fed. Pollan himself actually followed a steer from youth to slaughter, in an attempt for him to better understand where his food is coming from, providing a very different definition of the term “free range.” He also follows major “organic” companies that many of us are likely familiar with, like Cascadian Farms, back to their roots and shows us just how truly “organic” these large companies are. The third dinner, the organic pasture-grown meal, is one provided completely by a proud local “grass” farmer, Mr. Joel Salatin. The VAST differences between Pollan’s experiences on Salatin’s farm and those he visited during his industrial organic meal are drastic. The chickens in the CAFO’s (concentrated animal feeding operations) of the previous chapter wouldn’t know what to do with this farm experience. Pollan works a week on Salatin’s farm, attempting to get experience in every aspect he can including the slaugthering of his chickens. This is backbreaking work for both the author and the farmers, but the love and care that is taken shows in the quality of the return. The final meal, one foraged by Pollan himself, follows the author as he reaches out to experts and literally hunts and gathers an entire feast. The amount of work that is put into this meal is shocking, but the chapter itself is a powerful experience of hunting both meat, produce (mushrooms), herbs and even yeast! To say I enjoyed Omnivore’s Delimma would be inaccurate. I soaked up every little bit of information he put out there, albeit sometimes hesitantly. This is a read that I am PASSIONATE about sharing with you all, and hope many of you decide to pick up yourselves. Maybe it’s because I had the Young Reader’s version (again, don’t judge), but I found Pollan’s writing style covering a difficult topic very enjoyable. He tackles some serious subject matter in a way that not only captivates you, but inspires you to want to make changes for yourself. Our food and where it comes from is SUCH an important subject, and something that so many people are grossly misinformed about so I am THANKFUL that Pollen wrote about this subject the way he did. I found the chapter of Organic Pasture grown foods the most engrossing. It made me want to provide more of my OWN produce and groceries. Where Zach and I live in the high planes may not have the greatest growing season, but I am confident that we can all take more ownership and control of what we eat and how we get it. Surely this may mean more work and a little more money, but it’s my body’s fuel! It’s worth it, right? One thing this book really brought up for me is the idea of seasonal foods (basically every food we all enjoy). Unless you live on the equator, most of us are familiar with the idea of seasonal foods, like fruits and veggies. Sure, in today’s world we can have anything we want at any point in the year. . . but where is that food coming from? Even CHICKEN is seasonal, did you know that? This raised a lot of questions for me. Personally, I am picky about my foods. I love salads and fresh produce. I love white meat and fish. Are these things that I would be willing to give up at certain points in the year to eat more locally? I highly recommend this book to ANYONE who is here and enjoys Chocolate Medals :). Please pick it up for yourself, you won’t regret it! Question of the Afternoon: What’s the last book that moved you? Disclaimer: This post was sponsored by Grammarly and their Bloggership program but all thoughts and opinions are completely my own.